Germar assured me through email two weeks ago this book was being proofread. And the English translation is the only other handbook that can be expected for the rest of 2016. 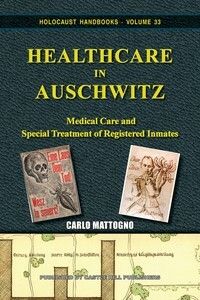 The Mengele book and the Einsatzgruppen book are both being worked on and only once those two are published will the other ones be tackled. Again, this is straight from Germar's mouth via email. The famous Italian Holocaust survivor Primo Levi informed us in his eyewitness account Survival in Auschwitz that a number of sickbays and infirmaries etc. existed in the area of the Auschwitz camp. The present book gives an overview of the camp’s organizational and historical development in this regard. For example, there was a change of policy among Himmler and his entourage toward the end of 1942 regarding the main function of Germany’s concentration camps. While initially reeducation and punishment were their main focus, exploiting the inmates’ productive potential became increasingly important later on. The main reason for this was the ever-increasing needs of the German armed forces for manpower. Another reason for the installation of sanitary facilities were epidemics which emerged repeatedly for a number of reasons and which had to be combatted. In the intro to the new printed edition of Treblinka, we see this. "This is a reprint of the 2005 second edition of this book. Since that year, the authors have found a wide range of additional documents and testimonies. 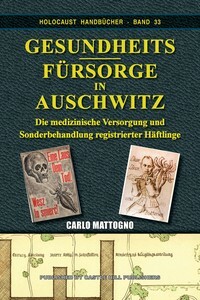 Most of them are discussed in the two-volume, 1396 page study [i]The "Extermination Camps" of "Aktion Reinhardt": An Analysis and Refutation of Facticious "Evidence," Deceptions and Flawed Argumenation of the "Holocaust Controversies" Bloggers, by Carlo Mattogno, Jurgen Graf and Thomas Kues, which deals with all three "Aktion Reinhardt" camps (Belzec, Sobibor and Treblinka). The authors plan to completely overhaul this present study on conjunction with the two monographs in our series Holocaust Handbooks dealing with Belzec and Sobibor (For details see the books advertised in the back of this book). Since this process will take a long time, and because the present book has become virtually unavailable on the book market, we have decided to reprint it, and offer it for retail until the new edition becomes available. While respecting the victims, whether of foul play or of circumstance, this study nonetheless tries to conduct Auschwitz research on the basis of the forensic sciences, where material traces of the crime and their interpretation reign supreme. Although it is generally agreed that no autopsies of any victim has ever been performed, most of the claimed crime scenes – the chemical slaughterhouses called gas chambers – are still accessible to forensic examination to a greater or lesser degree. So, how did these gas chambers of Auschwitz look like? How did they operate? What were they used for? In addition, the infamous Zyklon B can also be examined. What exactly hides behind this ominous name? How does it kill? And what effect has it on masonry? Does it leave traces that can be found still today? These and many other questions are thoroughly examined in this study. The horror of Auschwitz is meticulously dissected, and thus, for the first time, it really becomes comprehensible. This book features 128 color images (and 98 b&w images), hence it is printed in 4 colors throughout. It will appear in early April 2017. You can already order it now! 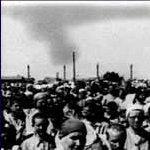 As one can see on holocausthandbooks here, THE CHEMISTRY OF AUSCHWITZ, is nothing more than a newly titled, and updated version of THE RUDOLF REPORT. 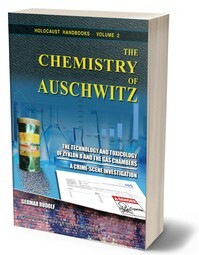 Werd wrote: As one can see on holocausthandbooks here, THE CHEMISTRY OF AUSCHWITZ, is nothing more than a newly titled, and updated version of THE RUDOLF REPORT. 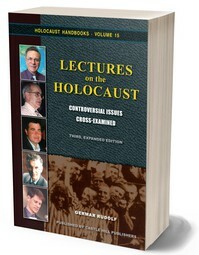 The Rudolf Report is one of the nails in the 'holocaust' coffin. An updated version is a veritable spike. I did not mean it like that. I meant only to eliminate possible confusion that I myself experienced when I saw the book. I thought it was a totally new book. But it is not. It is an updated edition of The Rudolf Report, but it also has an interesting new title. Werd wrote: I did not mean it like that. “If you cannot say what you mean, your majesty, you will never mean what you say and a gentleman should always mean what he says.”. 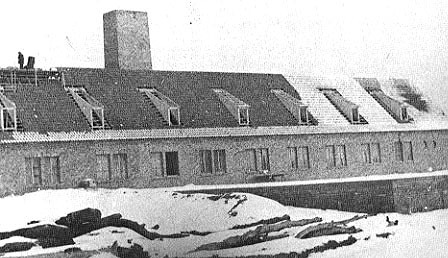 Taken January/February 1943 where there are no such 'chimneys' / columns for the alleged insertion of Zyklon-B. The 'chimneys' / columns are claimed to have been ca. 2 feet high. The snow is 2-3 inches high. According to Auschwitz "expert" Robert Jan Van Pelt the 'chimneys' / insertion columns, which were said to protrude out from the roof, were added as an adaptation in August, 1942. Third, revised and expanded edition of 2017. Did you know that the mass media were reporting an impending holocaust of six million Jews since the late eighteen-hundreds? Did you know that the media have repeatedly exposed the stories of Holocaust survivors to be lies? Did you know that many mainstream scholars have expressed doubts about the accuracy of Holocaust history books? Did you know that historians critically investigating the Holocaust narrative are thrown into jail in most European countries, and are not allowed to defend themselves in court? Notice how in this new English edition, they made room on the front for a picture of Carlo mattogno. The previous English edition only had about 510 pages. Unfortunately for us though, we'll be waiting about another 2 years for the English edition of the newest German release that just came out a few days ago. I understand that we've waited longer than usual for this one as a pose to the others, but IMO it should've been a consistent English/German release, that way it's at least less work for the translators in the future when we finally get the rest of the upcoming volumes. Which book are you talking about? I do not know because "The Chemistry of Auchwitz" and "Lectures" both have corresponding German and English releases right now. Do you mean this one? Werd: The current English edition of "Lectures" is the translated version of the 3rd German edition released back in 2015(?). A 4th German edition was just released a few days after the one that just came out. CognitiveDestruction wrote: Werd: The current English edition of "Lectures" is the translated version of the 3rd German edition released back in 2015(?). A 4th German edition was just released a few days after the one that just came out. Third, revised and expanded edition of 2017. Yes, I'm well aware that the current English edition was just released is the 3rd edition. That's a translated version of the 3rd German version of "Lectures" that was released over 2 years ago(This is the earliest post I can remember: viewtopic.php?p=72149#p72149). We just got a 4th German edition(https://shop.codoh.com/book/75/75), so this volume isn't in sync. CognitiveDestruction wrote: Yes, I'm well aware that the current English edition was just released is the 3rd edition. That's a translated version of the 3rd German version of "Lectures" that was released over 2 years ago(This is the earliest post I can remember: viewtopic.php?p=72149#p72149). No, just compare it to the 3rd German edition. It’s the same as the 4th German edition in English.